What's the best part of any minor league stadium? Did you say, "outfield fence advertising?" This card's background features both Col. Hawkins' Truck Service and Atlantic Char-(something, char-broiler?) Service. Mid-Atlantic minor league fans know two incarnations of the Peninsula Pilots. 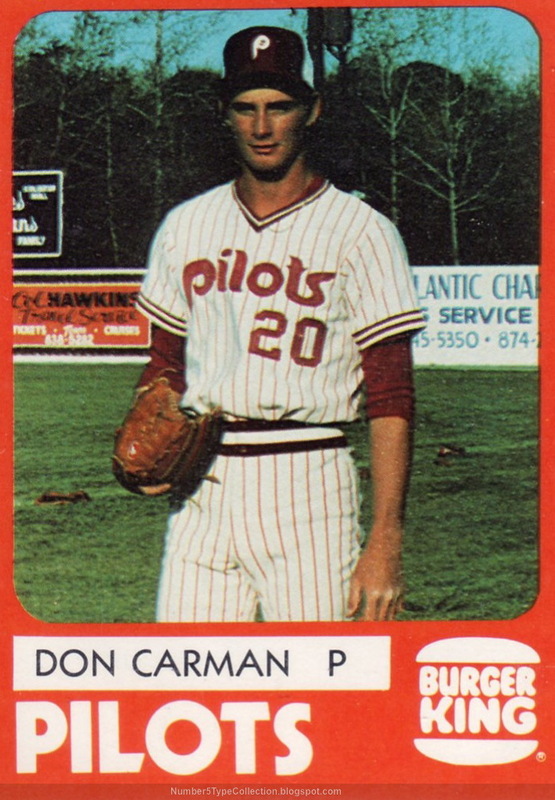 Single-A team, Carolina League (1976 - 1992): You can guess the circa-1980 Phillies connection from Mr. Carman's purple-and-pinstripe uniform. 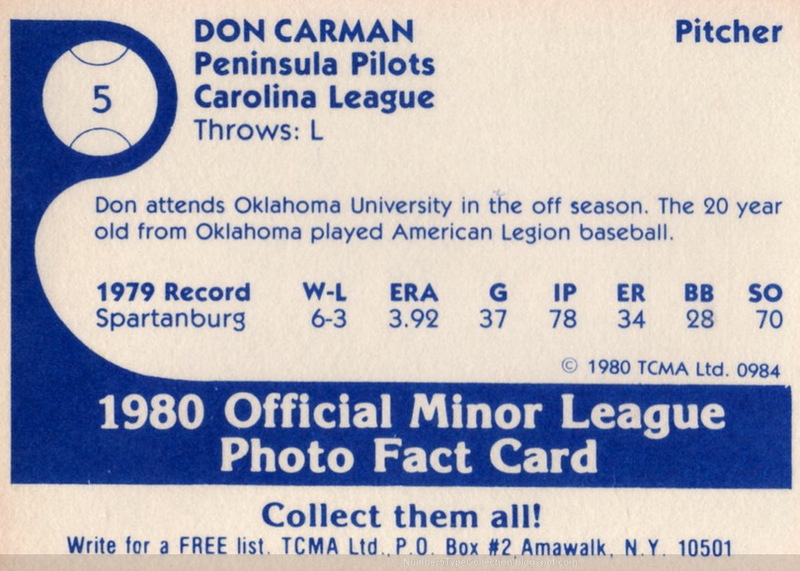 The parent club won their first World Series in 1980, which is probably still exciting for the minor league affiliates. Amateur summer team, Coastal Plain League (2000-present). Summer leagues invite top college and high school players to relocate for a few months, play some baseball, and make it easy for pro scouts to find them. The 2010 Coastal Plain League season runs from late May to early August. 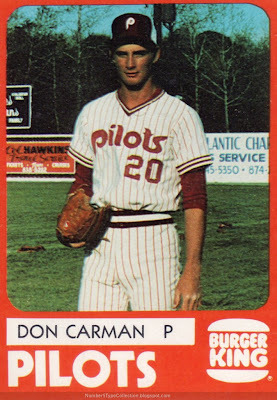 Dan debuted with the Phillies in 1983 and pitched in the majors through 1992. I loved this excerpt from his Wikipedia page. Carman was also known for his sense of humor; tired of repetitive postgame questions from sports reporters, in the 1990 season he posted a handwritten list of 37 standard responses on his locker and invited reporters to take their pick. The list, including clichés like "I'd rather be lucky than good" and "We're going to take the season one game at a time," was eventually published in several newspapers in its entirety. Fans don't like stock questions and answers either, so why do writers keep asking them? Value: Most minor league singles cost a dollar or two on eBay or Becket Marketplace. Fakes / reprints: Haven't seen any out there, at least not from the 1980 TCMA sets. Could it be Atlantic Charter Fishing Service? The team was located in Hampton, Virginia. Plenty of water there. Writers ask stock questions because players have stock answers to just about anything you ask. You have to work very hard to ask a question of a professional athlete that isn't answered with a cliche. However, if you go to the effort of asking different questions, periodically you get some good stuff. I have actually had some pro and college athletes shake themselves out of their cliche stupor and respond with "where did you say you were from?" after I asked a question. They were surprised to hear something different. However, that said, writers who are under daily deadline pressure often lapse into stock questions, just as players lapse into stock answers. It's no different from the "mail-it-in-just-get-it-done" tendency that occurs in hundreds of professions. Interesting Night Owl, thanks for saying so. What would you have thought of Carman's list of stock Q&A in his locker? Overly cute and sarcastic? Atlantic Charter Fishing sounds good to me, Mark! I would have been amused by Carmen's list and probably tried to turn to my advantage -- either write a story about it or maybe ask him what kinds of questions he'd rather hear and go from there. This Slate article also features Don, who went through years of fan mail some time after retiring. I have the entire team set and every card is autographed. The uniforms were identical to the Phillies red Pin Strip (not purple). This team had the likes of Julio Franco and a couple others and they one the Carolina League Championship that year at War Memorial staduim in Hampton. At 10 years old , I had befreinded many of the players, served as a batboy and spent time in the clubhouse. Lots of bats and balls and other things from that summer!